Making dinner after a long day of work is the last thing I want to do! The thought of leaving the house to go get something to eat after I just got home isn't something I want to do either. My first priority when I get home is to change into my pajamas, spend time with my family, and lounge around the house. Over the years I have come up with some simple, low maintenance dinner ideas that have become staples around our house. Many of these meal ideas involve throwing some things into the crockpot in the morning, letting it cook during the day, and then making a couple easy sides to go with the meal right before we eat. Each weekend I sit down and plan which meals I want to make for the following week. I check our weekly schedule of activities and events to see which meals work, what sounds good to eat, etc. I make out my grocery list and head to the store. I buy everything I need for that week's meals - even the meat. When I get home I freeze the meat, bread items, or anything else that might not be as fresh left out for a couple days. Making sure you have all your grocery items purchased before the work week begins is a huge part in making dinner each night easy. If you hate going to the grocery store then you should definitely check out the Walmart Grocery Pick-up service! 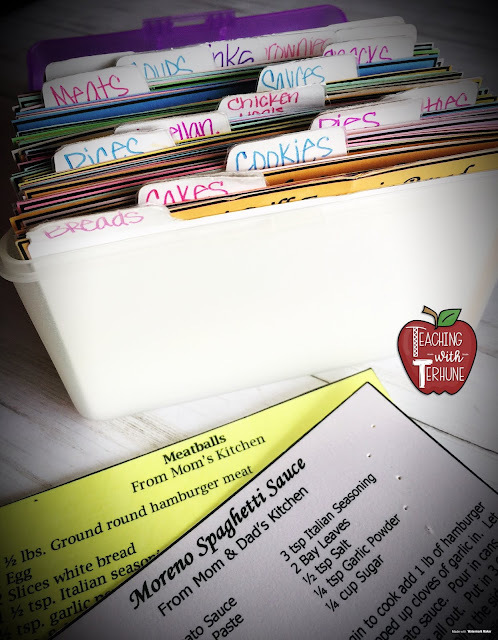 Over the years when I find a recipe that my family loves I write it down on a recipe card and add it to my recipe box. When I am looking for meal ideas for the week I simply just thumb through my recipe box. 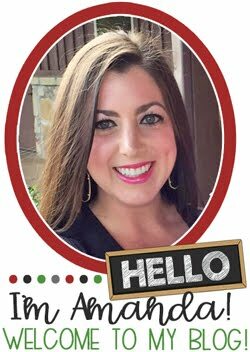 By having all my favorite recipes in one spot it makes remembering meals easy. I don't have to pull out recipe books, pull up Pinterest, etc. to find my meals for the week. Here's a list of some of my favorite go-to meals for the work week. 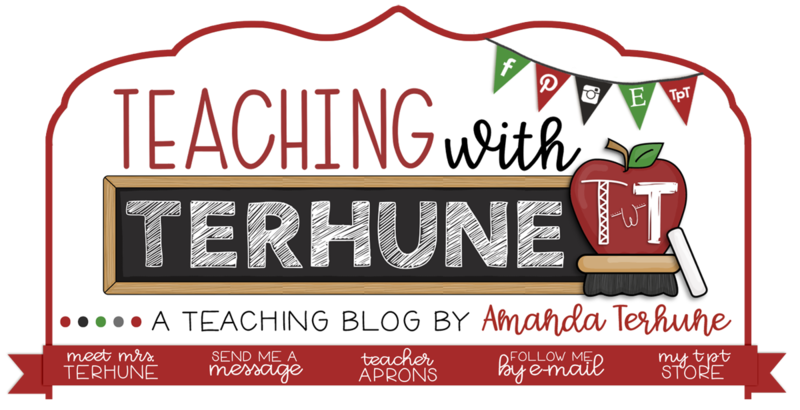 I hope to add more meals to this list, so keep checking back for more ideas! To prep the chicken for the sandwiches simply add 1/2 cup of soy sauce, 1/2 cup plus 2 tablespoons of wine (I've used a dry sherry, white wine, Vinho Verde, or anything that's in my fridge at the time), dump in 1 20oz can of pineapple slices with the juice, 1/4 cup red wine vinegar, 1/4 cup sugar, and 1/2 teaspoon of garlic power. Stir together. Add 1-2 pounds of chicken to the mixture. Cook on low for 6-8 hours. Once you're ready to make your sandwiches shred apart the chicken and top on your favorite crusty roll or toasted hamburger bun. Add sliced cheese, bacon, and any other thing to your sandwich you would like! My husband likes mayo on his sandwich and I like to dip my sandwich in apple butter! These sandwiches are great left over and make great lunches for the week too! This crockpot meal is one of our top favorites! 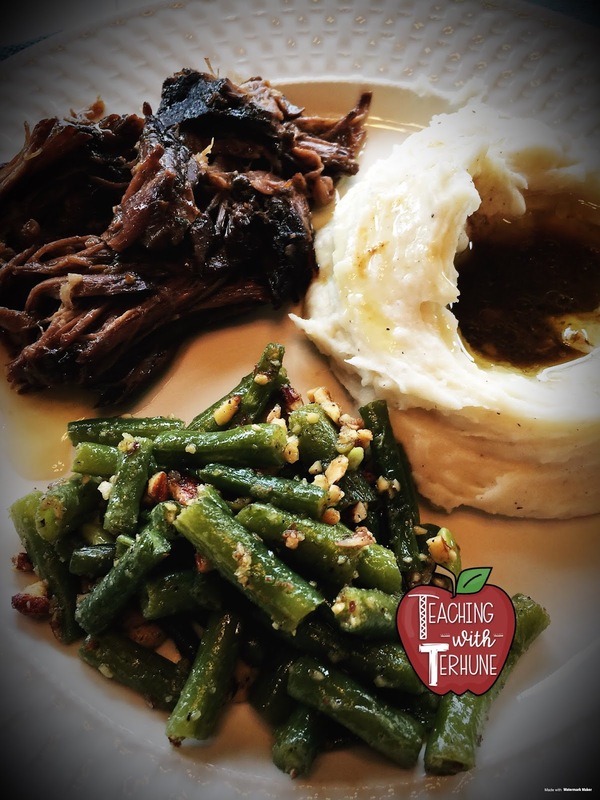 It is different than most beef crockpot meals out there and so delicious! You can find the recipe HERE. The only change I make in the recipe is I leave out the raisins. Ready to cook for the day! Whip up some mashed potatoes or any sides of your choice and your dinner is ready! The best thing about this meat is it makes the BEST tacos! Make some tacos for dinner the next night with your leftover meat or have tacos for lunch! Either way you can't go wrong! To prep the chicken add 2 tablespoons olive oil on the bottom of your slow cooker. Add 1 small chopped onion and 4-5 chopped garlic cloves. Dump in 1 14.5 oz. can of chicken broth and 1 14.5 can of diced tomatoes with basil, garlic, & oregano. (I like to chop the tomatoes up a second in my chopper before dumping them in.) Add 1 1/2 cups of red wine. Finally add 1/2 teaspoon pepper, 1/4 teaspoon salt (or to your liking), 1/2 tablespoon Italian Seasoning, 1 tablespoon sugar. Stir together and add 2 pounds of chicken breast in the slow cooker. Let cook on low for 6-8 hours. We like to place the chicken and juices over angel hair pasta and top with parmesan cheese! 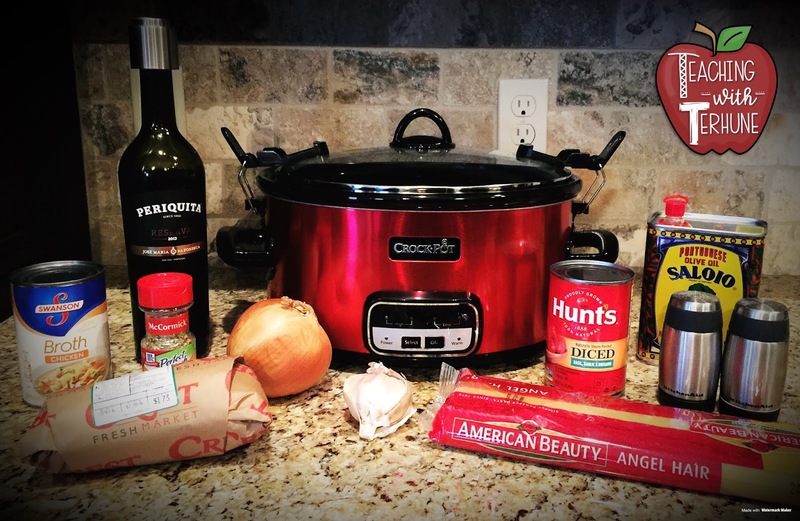 This BBQ chicken crockpot meal is super easy! Just dump 2 cups of your favorite BBQ sauce into the crockpot. Add 1 cup of water, 4 tablespoons of brown sugar, and 1/2 of an onion sliced. Stir together and then add about 2 pounds of chicken. Pair your BBQ chicken with some of your favorite sides. This Cracker Barrel macaroni & cheese is so delicious! We like to have this macaroni & cheese, baked beans, and corn with our BBQ chicken. This roast is my husband's favorite! 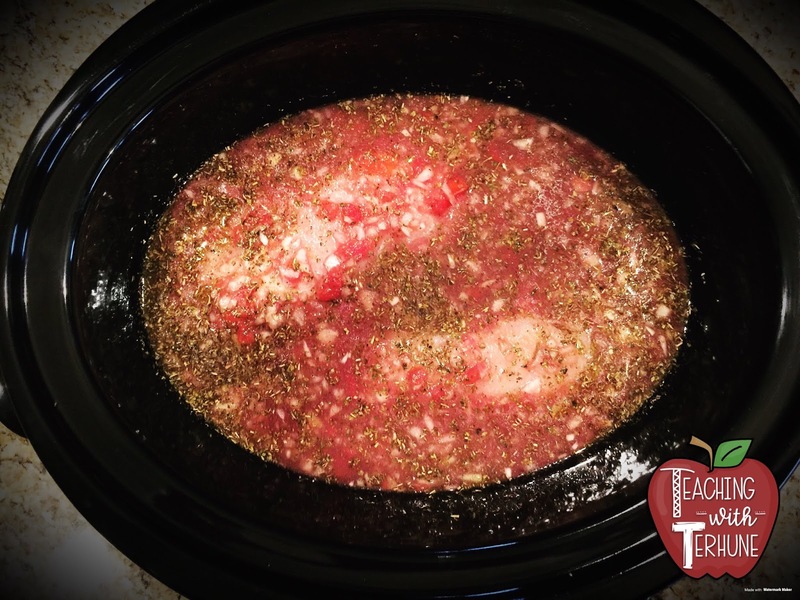 Place a 2-3 pound chuck roast in your crockpot. Sprinkle one package of McCormick Au Jus mix and one package of dry Hidden Valley Ranch Dressing mix on top of the roast. Add 1 stick of butter (I only do 3/4 of a stick) and 5 pepperoncini peppers. Served with some mashed potatoes and green beans! This meal is just three simple ingredients dumped into the crockpot: 1-2 pounds chicken breast, 20 oz. can of pineapple chunks, and your favorite Hawaiian style BBQ sauce! Dump everything into your crockpot and cook on low for 6-8 hours. Simply add 2 cups of water, 2 cans of beef broth, and 2 1 ounce packages of dry onion soup mix to your crockpot. Stir together. Add some salt and pepper to both sides of your 2.5-3 pound chuck roast and add to your crockpot. It's that simple! Then let cook on low for 6-8 hours. Add the meat to a nice crusty roll, top with cheese, and ladle the juices into a small cup for dipping your sandwich into! This meal is super quick to throw together. Just place 1/2 cup of water in your crockpot. Add a package of Ranch Salad Dressing and Seasoning Mix to the water. Stir together. Add 1 to 1 1/2 pounds of chicken to the mixture. Top with one 8 oz. package of cream cheese. When the chicken is finished cooking shred the chicken in the juices. Add the chicken and juices on top of some angel hair pasta. Then add bacon bits on top. The bacon is a must! You can also add some chives, crushed red pepper seasoning, parmesan, etc. on top as well. Taco night is one of the easiest and yummiest dinner nights. We love the Taco Bell Cheesy Double Decker Taco Dinner Kit. It comes with hard and soft taco shells, Velveeta cheese sauce, and seasoning for your ground beef. 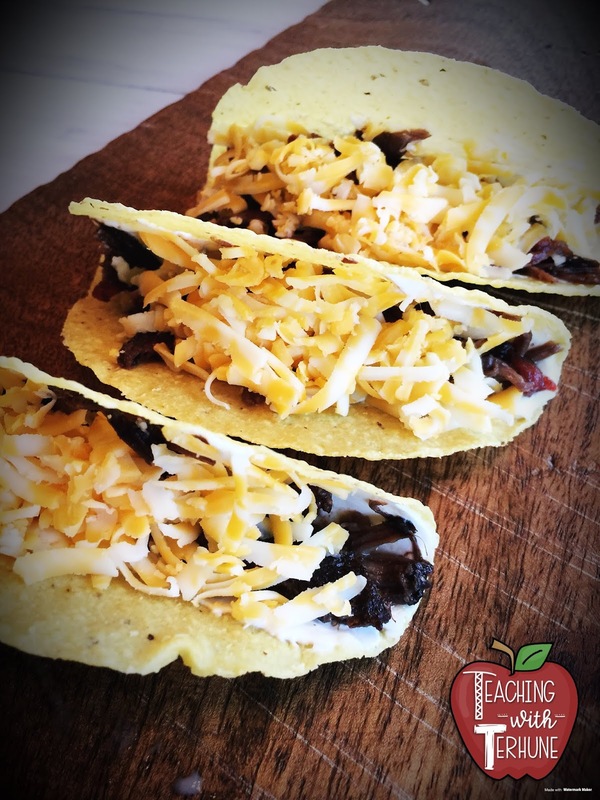 We make our double decker tacos and pair them with some Spanish rice for a quick and easy dinner. You can't forget about an easy hamburger night for dinner. I just buy a couple pounds of hamburger meat, add Worcestershire sauce, Weber hamburger seasoning, mix it all together and make paddies. We like to do little hamburger sliders. If I have extra hamburger patties I like to freeze them for another easy dinner in the future! You can literally take the hamburger paddies and rolls out of the freeze the same day you want to eat them. They will unthaw in no time! Add your topping and sides for an easy dinner! Spaghetti night is another easy dinner night. You can pick up your favorite jar of spaghetti sauce and pasta for a quick and delicious dinner. I have a favorite family spaghetti sauce recipe that I like to make. Cooking the sauce is definitely a weekend project but after it's cooked I divvy up the sauce into glass containers and freeze it! I get multiple meals out of the sauce so it's definitely worth the little bit of extra effort it takes to make it. I like to cook up my favorite batch of homemade meatballs and sausage to add to the sauce. I add the meat to the sauce! Finally, I divide the meat and sauce into glass containers to store in the freezer. When pasta is on the menu I just simply take one of the containers out of the freezer. It has our meat and sauce ready to go! Pair your pasta with some Caesar salad and some garlic bread! This meal takes about an hour to cook but it's definitely worth it! This meal is one of my son's top favorite meals. On your stove top sauté 1/2 of a chopped onion in olive oil until tender. Add 1/4 - 1/2 pound of Italian sausage and 1 pound of a chicken breast (cut into cubed pieces). Cook until the meat is done. Add 5 chopped up garlic cloves and cook for a few minutes more. Add 3 tablespoons of red wine, 1/4 cup plus 1/8 cup of tomato sauce, 3/4 cup of water, 1 teaspoon salt, 1 teaspoon pepper, and 2 teaspoons of parsley. Let the mixture simmer on low for about 30-45 minutes. Then add 1 3/4 cup of water to the mixture and bring to a boil. Once boiling add 2 cups of uncooked rice into the mixture. Stir and cover. Cook 20-25 minutes until the rice is done. Grab a quick premade bag of salad or make your own salad and fixings. Stop by your favorite fried chicken place on your way home from work and grab a couple fried chicken tenders. Top on your salad. It makes for a quick and yummy salad! I seriously prefer my own homemade salad than any salad I can buy anywhere! Hopefully you found a couple dinner ideas. Keep checking back! 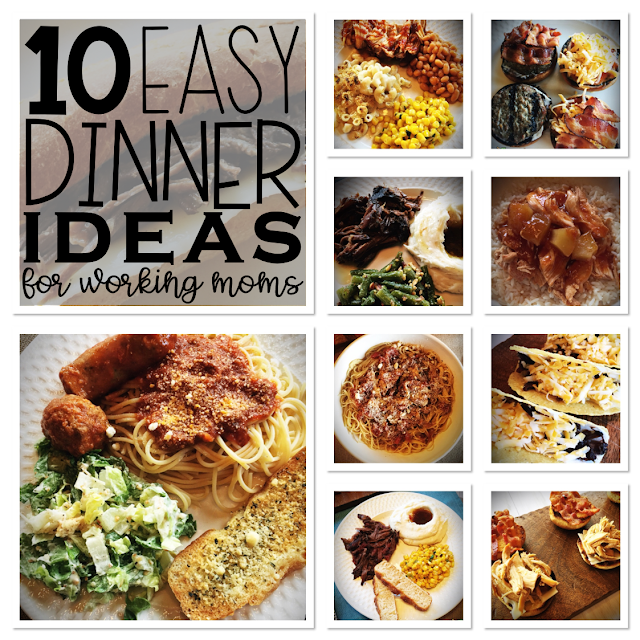 I will continue to add more easy dinner ideas to the list!